WildFlower Lotus - WildFlower Lotus Jimdo-Page! TRD is middle-sized dog which has an athletic body and short, soft and pleasant to touch wool. Wool on the dog’s back grows in the opposite direction, it’s called "Ridge". Oriental narrowed eyes, and special Thai smile. 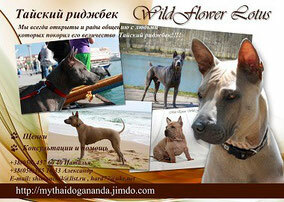 Thai Ridgeback Dog always attracts the attention of people and everybody became really interested in this exotic animal. On our site you can find information about breed, character of the dos, especially education and growing, a lot of photos and videos, and all about our favorite dogs Nany and Lisa.